Perfect for those people whose preference is more for a luxurious and very stylish “bush hotel” with loads of facilities, rather than a traditional game lodge – will be great for many young professionals looking for a stylish weekend break! Shepherd’s Tree is home to a fantastic Amani Spa which makes this the perfect destination for a Spa breakaway in the bush! Great views from the lodge over the gorgeous undulating landscapes of the Pilanesberg! Shepherd’s Tree is just 14 kilometres away from Sun City – perfect if you fancy a round of golf or a little flutter on the tables as well as a bit of bush! if you’re a fan of chic modern hotel décor and also want the benefit of more extensive facilities including a superb Spa, then chances are you’re going to absolutely adore Shepherd’s Tree! And now for something completely different! 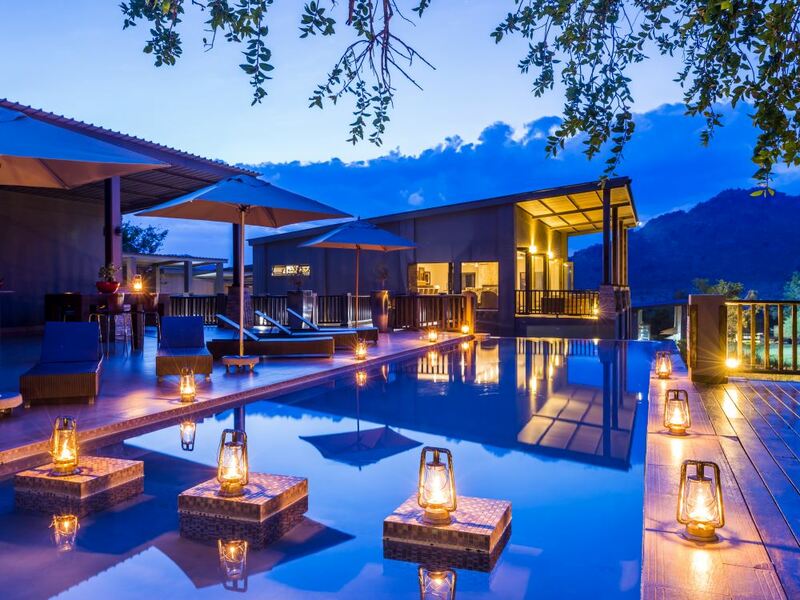 Shepherd’s Tree is about as far away from the stereotypical game lodge as you can get – forget thatched roofs and rustic bomas with log fires; Shepherd’s Tree is all about sleek minimalism and contemporary styling and décor. 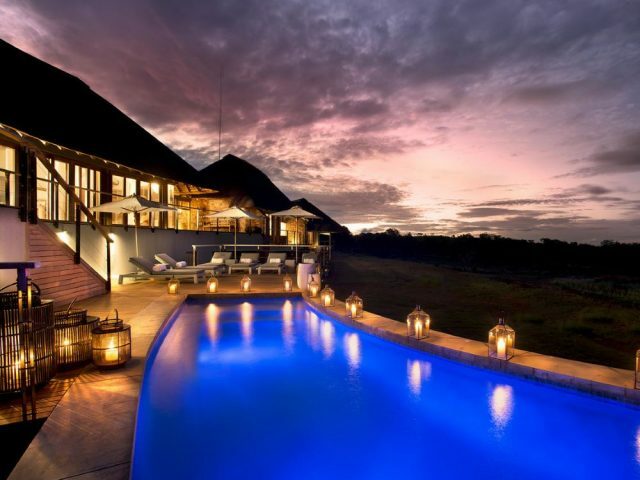 It’s also a lot bigger than the typical game lodge too, with 30 suites in total adding to that feel of being more like a 5 Star “hotel in the bush”. 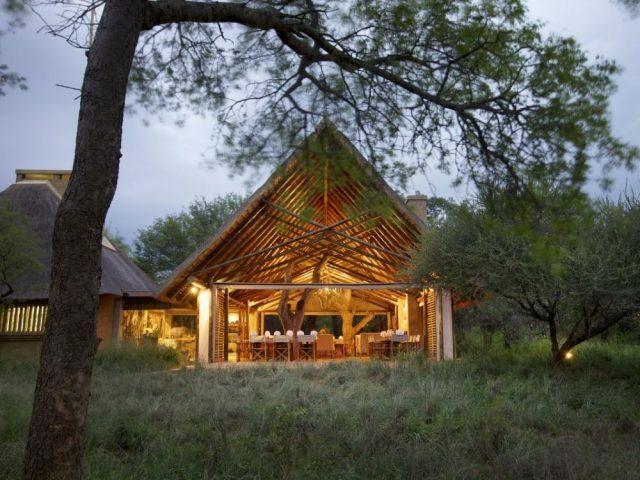 Clearly then Shepherd’s Tree is going to be one of those properties that divides opinion down a very distinct line – if you’re one of those people who loves small and intimate lodges in traditional game lodge style, then you’re probably advised to avoid at all costs; on the other hand, if you’re a fan of chic modern hotel décor and also want the benefit of more extensive facilities including a superb Spa, then chances are you’re going to absolutely adore Shepherd’s Tree! 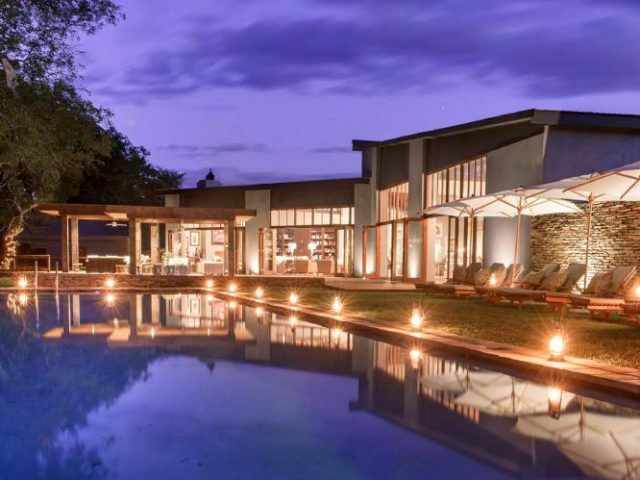 Situated in an exclusive use zone in the far western sector of the Pilanesberg reserve, Shepherd’s Tree enjoys a gorgeous location overlooking a scenic natural amphitheatre. The 30 suites are scattered along the hillside to the right of the public areas as you look out at the bush, and the furthest are quite a distance away from the main area as you can imagine – it’s not an issue though as a quick call to reception will have a golf buggy come and collect you (you could of course always walk!) The Suites are split into 26 Standard Rooms built as 13 blocks of 2 rooms) and then 4 Executive Suites – what is quite clever is that the Standard Rooms can easily be converted into Family Suites through the opening up of a spacious lounge area (usually locked) which usually separates the Standard Rooms when they are used in that configuration. Opening up the unit in this way makes it a perfect and very spacious unit for families, with both parents and kids obviously having their own full bathroom facilities! Yet when used as 2 Standards, the now locked and inaccessible lounge area separates the 2 rooms nicely and ensures excellent privacy. And what of the rooms themselves? Well as indicated above they are very much your typical modern 5 Star hotel rooms – all sleek and stylish with a contemporary minimalism that works extremely well with the muted and elegant colour palette of tans and beiges. To be honest they are pretty generic and could look equally at home whether they were located in Sandton, Plett or London – but then again you’re probably going to be staying at Shepherd’s Tree precisely BECAUSE the rooms aren’t your usual rustic game lodge fare! As you would expect, they’re fully equipped with all the mod-cons - the bathrooms are particularly striking with their huge standalone baths overlooking the bush through a large showcase window, or you could enjoy the unmatched pleasure of using the outdoor shower (unusually though the standard rooms don’t have an indoor shower, so when it’s chilly you have the choice of either braving the cold with a shower outside or settle for a soaking bath in the warmth of inside) The 4 Executive Suites are similar in feel and decoration but obviously much more spacious with a comfortable lounge area – they also add an indoor steam shower to the romantic double outside shower! All of the rooms boast private patios with great views out over the bush, however a small criticism is that there is no real shading of these patios so you may feel just a bit too exposed to the sun in summer particularly. The main lodge carries on with the same architectural and décor feel and again the sleek look of the facilities remind you far more of a boutique urban hotel than a traditional game lodge. There’s a casual lounge, bar and a gourmet restaurant inside but the highlight has to be the spacious entertainment deck with a well-designed outdoor cocktail bar overlooking a spectacular rim-flow swimming pool, all set in an elevated position allowing for expansive views over the local watering hole. A massive draw-card for many will be the award-winning health and beauty Amani Spa offering a range of gorgeous spoiling treatments! Finally Shepherd’s Tree is the ideal corporate venue as it boasts a dedicated state-of-the-art conference and functions centre for up to 70 people. If you can drag yourself away from the Spa and inviting pool deck, there are 2 daily game drives which you will enjoy using either the lodge’s private traversing area or the network of public roads. 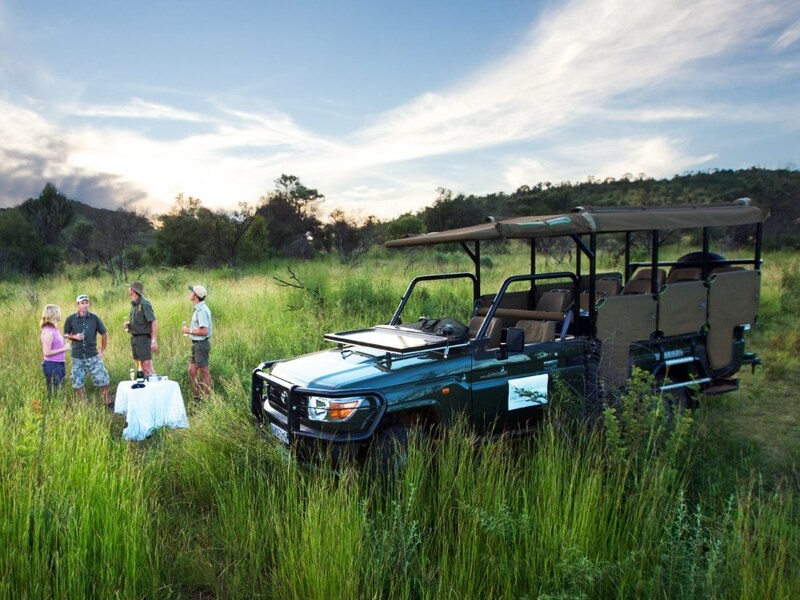 Unlike any pleb in their car though, you are seated in a 4x4 open vehicle which provides a far superior wildlife experience, also enhanced by the fact that you’re accompanied by a knowledgeable and experienced ranger who knows the park inside out. And with the Pilanesberg being home to a very diverse range of animals and birdlife you’re likely to enjoy some great sightings! Otherwise, Shepherd's Tree offers an incredible array of other activities both at the lodge and nearby – these include golf and the “Valley of the Waves” at nearby Sun City, clay pigeon shooting, hot air ballooning, archery, quad-biking and much more!